Are you looking for a truck that has it all. A truck that the previous owner upgraded it completely to make it look and sound as good as they come. This 2009 Ram 1500 Sport has a completely new customer sub sound system so if you're ready to feel the bass when you drive, well this beauty is perfect for you. With a lift kit already done on this truck, you won't need to do a thing but jump on it and drive away. 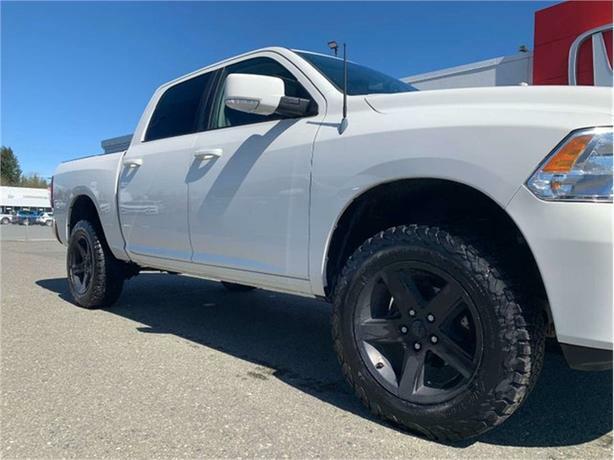 If you're looking for an aggressive and adventurous truck that is ready to take you where you need to go, this 2009 Dodge Ram 1500 Sport will be perfect for you. Stand out in the crowd with custom lift kit, custom sound system, and fully loaded features that keep you connected not only to your technology but for what nature has to offer. This incredible truck comes loaded with so many features that you won't even get to the end of the sentence before you're wanting this to be yours. Enjoy the warm rays of sunshine this summer will have to offer with a sunroof, cool down with ventilated seats. But if the weather gets cold, don't fret! This Ram has heated seats, heated leather wrapped steering wheel, and remote start that works with the outside temperature so your vehicle is always the right temperature inside. Leather Interior, seating of 5, front and rear parking sensors, dual zone climate control, AC, tow ready, box liner, power outlets, tiptronic shifter, built in navigation, back up camera with guide lines, and Bluetooth. Two 10" Subs Upgraded from stock.